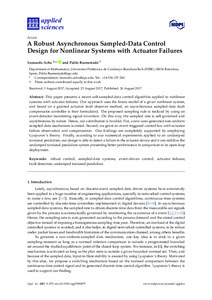 This paper presents a recent self-sampled-data control algorithm applied to nonlinear systems with actuator failures. Our approach uses the linear model of a given nonlinear system, and based on a granted actuator fault observer method, an asynchronous sampled-data fault compensator controller is then formulated. The proposed sampling rule is realized by using an event-detector monitoring signal invention. On this way, the sampled rate is self governed and asynchronous by nature. Hence, our contribution is twofold. Fist, a new auto-generated non-uniform sampled-data mechanism is stated. Second, we grant an event-triggered control law with actuator failure observation and compensation. Our findings are completely supported by employing Lyapunov’s theory. Finally, according to our numerical experiments applied to an undamped torsional pendulum, our design is able to detect a failure in the actuator device and it can stabilize the undamped torsional pendulum system presenting better performance in comparison to its open-loop deployment. Acho, L., Buenestado, P. A robust asynchronous sampled-data control design for nonlinear systems with actuator failures. "Applied sciences", 26 Agost 2017, p. 1-9.
actuator failures, event-driven control, fault detection, robust control, sampled-data systems, undamped torsional pendulum.